In the first three lessons, you explored ways to locate your center of gravity using some simple images. You also learned how to use your center of gravity to move more easily. In this lesson, we’re going to take using your center of gravity to a new level. This lesson will involve some deliberate tightening of muscles in your abdominal area. If you have any reason to be concerned about doing this – for example, if you’ve recently had surgery or if you are experiencing abdominal pain of any kind – consult your doctor before doing any of the exercises described in this and the next two lessons. Bear in mind that there is a tremendous range possible in the intensity of your lifting effort. Always start with a very small amount of effort and then gradually increase it. Lifting the front to back line that passes though your center of gravity. The red arrows indicate the direction of lifting. Start by standing and using one of the simple images you learned to use in Lesson 2. 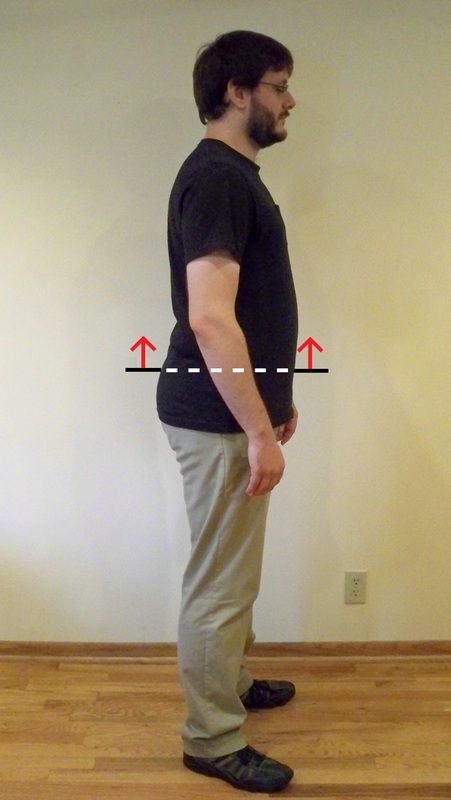 I’m going to use the imaginary front-to-back line (the “arrow”) as an example – the line passing through your body at the height of your center of gravity, which is two inches below your navel. After you’ve mentally connected with the arrow, lift it. Don’t stand on your toes. That would certainly lift it up in space, but that’s not the intent of this exercise. To lift the arrow, first make a decision that you want it to be higher within you. Then simply lift it, contracting some muscles in that area of your body. The specific muscles you contract are not important. What is important is the idea that you are actually lifting the arrow within your body. This is definitely a new and unfamiliar exercise. Don’t be surprised if it requires a little practice. One thing that can help is keeping your two index fingers gently in contact with the front and back of your torso, two inches below your navel, as you lift the arrow. Lifting your center of gravity is definitely a physical exercise, so only do this for very short periods of time until you have a good sense of how much lifting you can do, and for how long you can comfortably do it. It’s best to think in terms of a few seconds at first until you’ve had plenty of experience with this process. When you place the palm of your hand on your belly in the vicinity of your navel, you’re likely to sense some firming of your abdominal muscles when you lift the center of gravity. What else do you notice when you lift it? You may notice changes in your legs, your chest, and your head and neck. You may feel taller. Based on many students’ experiences, you may feel your legs are supporting you in a slightly different and unfamiliar way. You may notice that your chest seems expanded and that your breathing is fuller and easier. Now, let’s use this process to change the way you move. Start by standing, then locate the arrow, lift it a bit, and finally move the lifted arrow in the direction you’d like to go – just the way you learned to do with a regular arrow in Lesson 2. Here is an important reminder – be very clear that your intention is only to lift the arrow. You will almost certainly sense other parts of your body moving, but focus your intention on lifting the arrow. Once you feel comfortable moving a lifted and directed arrow, experiment with shifting back and forth from “ordinary” walking to “lifted and directed” walking. What do you notice when you you walk with a lifted arrow? What do you notice when you go back to ordinary walking? Often, students report that walking seems much smoother and easier when they use the lifted arrow. They are often amazed that, even when they lift their arrow with intensity, there is no increase in tension in the upper part of the body. In fact, the arms usually move more freely, the head is more easily balanced on top of the neck and breathing is fuller and easier. When they stop using the lifted arrow, students often report that they sense a heaviness in the body. Sometimes this is most apparent in a sinking down of the chest. Sometimes they notice that the feet come down more heavily on the floor. When you pay attention to what happens when you let go of the arrow lifting, you receive valuable information about your habitual way of walking. You can expand your lifted arrow experiments to include other activities, such as climbing a staircase. Of course, you can use the side-to-side line or the circle image instead of the arrow. In Lesson 5 we’ll explore lifting and moving your center of gravity while seated. Please use the comment box below to share your experiences with this exercise – and your suggestions for clarifying my written instructions. As I’ve said before, I’ve been teaching this process for quite a few years, but have not put it in writing until now and your feedback will be greatly appreciated. Uau esse blog é maravilhoso , eu realmente gosto de ver seus posts. isso, você vai ajudá-los . I was sceptical about the idea of moving the CoG, but was positively surprised by the results! I find the process energizing, it increases the body presence. May I ask where does the idea of lifting the CoG come from? I’m glad the process is working for you. It came out my own experiences with low back pain about 10 years ago. Thanks Robert – and what actually made you consider lifting the CoG up? Were you just playing around and discovered it worked, or was there some scientific reasoning behind it? Originally just playing around but the scientific reasoning quickly followed – it’s basic physics 101. You lift your Center of Gravity UP away from the ground as, for example, you direct your arrow FORWARD in walking. For me, “down” and “towards the center of the earth” are exactly the same thing – but I can see that for some people the latter would be better since there is less confusion about “down” as a direction in space and moving “down” within themselves. Forgive me if you’ve covered this nuance in a previous post. I usually find it helpful to communicate to my students that “down” is not an entirely accurate way to describe the direction of the force of gravity. It is more accurate to describe it as “towards” the center of the planet. Also, “up” is more accurately described as “away” from the center of the planet, towards the cosmos – since every object in Earth’s gravitational field is being attracted to the (same) point at the center of the planet. Sometimes this description gives just enough room in the mind of some students to experience a more dynamic relationship with gravity.